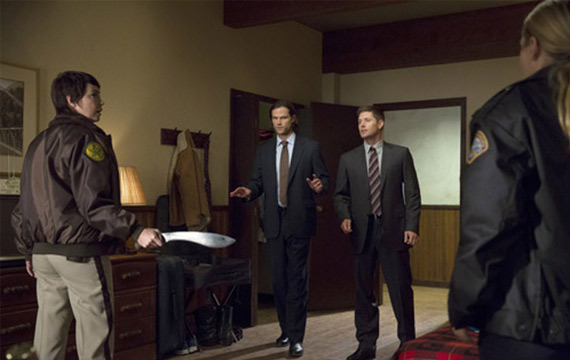 This week’s episode of Supernatural, entitled “Hibbing 911”, looks to be an interesting one. We catch up with both Jody Mills and Donna Hanscum (from 9.13’s The Purge) at a Sheriff’s retreat… where bodies are stripped of their skin. It’s the last episode before next week’s mid-season finale. And, surely, to be the last one before something seriously bad happens to Dean and Sam. Who wants to bet it’s involved with The Mark? Yeah, you wouldn’t be wrong. Then: Sam’s voice tells Dean about how he still has The Mark and is worried about his brother. It plays over images of Dean receiving The Mark from Cain (9.11’s First Born). “Sooner or later that’s going to be an issue.” Cas adds. Montage of Dean beating up SO MANY people. Recap of Jody Mills’s previous episode, where she protects and then takes in a runaway named Alex (Annie) Jones who had been kidnapped by momma vamp Celia (9.19’s Alex Annie Alexis Ann). And, lastly, Donna Hanscum’s vacation at a health spa where people lose weight eerily fast. She mentions how she had broken up with her husband, Doug. Sam approaches Dean in the library at the bunker. Dean, who, uncharacteristically has his nose in a pile of books. (What?) He’s researching into The Mark of Cain. But the Men of Letters seem to have a full amount of research on everything BUT The Mark. Including 600 pages “A Study in Werewolf Transgenderism” Volume 1. Dean is frustrated. And rightly so. The Sheriff of Hibbing, Len, walks up to the podium and nervously addresses the other Sheriffs that are seated in the audience. He welcomes them and encourages them to find partners that are 50 miles outside of their jurisdiction. The Sheriffs are dismissed and the group disperses to find their partners. Jody is on the phone, encouraging Alex that she can handle being home alone. Len and the Deputy are conversing in the background. “You are totally capable of not throwing a kegger… My faith in you astounds me too.” She says. She says goodbye to Alex and turns around, only to find that all the Sheriffs have partners and she doesn’t. Oh, well, her and Donna. Guess who ends up being partners? Donna and Jody check out the event list, including lectures and interactive training sessions like “Cops VS Winter: The Snow Must Go On” and “Preparing For A Riot: Why Not Try It?” Donna’s joy is interrupted by Kevin, another officer, telling her that a body’s turned up. Jody perks up. Apparently the trash man found the body behind the hardware store, eaten. “Like nothing left but the peach pit, you know?” Kevin describes. He says that the coroner is labelling it an animal attack, most likely a bobcat. Sam answers his phone, cheerfully asking Jody how she’s doing. She groans about the Sheriff’s retreat. Dean waves hi, and Sam relays the message. Jody asks how he’s doing, glad that Sam found him. The brothers ask how Alex is doing. Jody says that she’s a troublemaker – smoking grass under the bleachers – but “not luring men to their deaths”. (Hah!) Jody brings up the body. That the flesh had been eaten down to the bone. The boys don’t think it’s a vampire or anything weird. Dean offers that they could check it out. She declines but says she’ll call them if it gets to be anything she can’t handle. “Enjoy the retreat!” Sam teases her. “Screw you, Winchester.” Jody throws back. Dean gives Sam his puppy dog eyes. Sam caves. On the road they go! Jody goes to the coroner to check out the body of the victim. But said coroner rudely explains that unless she’s a part of the Hibbing Police Department, she can’t let her through. The day is saved when Donna appears behind Jody – much to Jody’s displeasure – and asks the coroner if she can see the body. Donna explains that Jody is her partner. The coroner lets them through. Inside, they examine the body. Only the skeleton is left on the ribcage. Organs, tissue, skin – all gone. Donna says she’s never seen anything like it, even though she’s hunted for most of her life. “I was afraid of that.” Jody groans. “Meaning?” Donna asks. “Nothing! Got me stumped too!” Jody stammers. Victim number 2 comes out of a house, carrying trash to the dumpster. The woman inside shouts at him. He tells her to watch her Top Model. He throws the trash into the dumpster and walks away. But something moves in the container. He goes to check it out. And is sucked into the dumpster. Screaming and eating sounds issue from inside. Blood spills out of the drain in the bottom. Len sits at a bar, still looking very stressed. Jody and Donna approach him on both sides. Donna asks about the animal attack. Len says he doesn’t know what did it and that he has animal control on it. The Deputy comes up to Len, pulling him away from the girls. Says that there is something needing his attention. Donna catches Doug dancing a few feet away with a girl. Jody comforts her, telling her he’s not worth her pain. Donna walks off. Jody walks back over to Len and asks if everything is good. They eventually tell her that another body’s turned up. But Len tells her not to worry about it. To enjoy the Sheriff’s retreat. Donna comes out of the bathroom to everyone gone. Donna finds Jody out in the parking lot, talking to Alex again. She sees keys in Jody’s hand and thinks that Jody is trying to abandon her. “Take a hint, Donna.” She mocks herself. Jody tells her that there’s been another animal attack. Jody explains that she was going to try to check out the morgue, but reasons that they were probably closed and it could wait. Donna asks if she can help Jody with anything. Jody sarcastically asks her if she knows anything about teenage girls. They open up to one another, talking about boys and teenagers. Donna says Alex will come around. Just like every teen does. She jokes about her body, Doug, and asks if Jody wants to get drinks. Jody declines and says that she’s going to crash, that it’s been a long day. “Don’t I know it.” Donna adds. Sam and Dean drive up to the retreat, “The Wait” by The Band plays in the background. They enter the lodge, in their FBI suits. Jody tells them that she could’ve handled it. “Nice to see you too.” Dean smiles. They hug. Sam and Dean tell Jody that they just came from the morgue. She asks if anything was missing. They tell her a wallet was missing. Jody mentions that a belt was missing from the first vic. Donna interrupts asking “Jodio” if she wants sugar. “Jodio?” Dean asks. She stammers around an explanation. Sam hits Dean, pointing out Donna. The brothers tell Jody that Donna nearly blew a case the last time they saw her. Jody says that she can’t seem to shake her; though she has been helpful, she’s been trying to keep her out of the “nightmare stuff”. The brothers ask Jody if she can distract Donna. But before they can leave, Donna spots Sam and Dean. Jody asks Donna if she wants to go check out the Expo, keeping her busy. Sam and Dean question Len and the Deputy. The deputy gets cocky with them. Sam and Dean ask about the security footage. Len says there’s nothing. He dismisses himself and leaves. Sam and Dean decide to split up: Sam checking out the security footage, Dean interrogating the Deputy. “Son of a gun” Donna gasps. Both she and Jody are eyeing the gun display at the Expo. Doug saunters up to them, saying that the seller is trying to pull the wool over their eyes. He and Donna flirt back and forth, with Doug insulting her some more. Jody steps in and calls Doug a douche. He walks away. Donna isn’t happy though. In fact, she says “Til you’ve actually lost a husband, you keep your mouth zipped about mine.” (WAY TO GO DONNA) Jody stands shocked, her mind flashes back to her husband and how she lost him (5.15’s Dead Men Don’t Wear Plaid). Donna asks if something happened to Jody’s husband. “We all have our crosses to bear, right?” Jody states simply. Donna tries to apologize but Jody shuts her down. Donna leaves to get some air. Dean walks up to Deputy Graham. He “apologizes” to him saying that he wants to work with people that have guts. Dean asks more about the attack. The Deputy says Len is being really quiet about the attacks. That he once offered to look at the surveillance footage but the Sheriff said he’d do it himself. Donna takes a moment to herself outside. She takes a deep breath and looks down, spying blood on the ground. She follows the blood trail and finds Len standing over the body of another Sheriff… and sees his unnaturally sharp teeth. Donna tries to run but makes noise. She hides behind a tree, breathing heavily, as Len looks in her direction. Donna races into the room, shaken. She interrupts Jody and Dean as Sam approaches them. “You ever think that there are things out there?” She whispers. She takes Jody away and tells her what she saw. That Len was hovering over the officer’s body and had very sharp, pointy teeth. Jody says she believes her and that Sam and Dean will too. Donna informs Jody that Len is staying in room 304. Both girls decide to go investigate it. Jody calls, telling Sam Len’s room number. Donna asks if she should tell the local police. “Oh trust me, the locals should not handle this.” Jody states. Donna and Jody break into 304. Donna finds a ton of sunblock lying on the bed. Donna questions it. She goes over to the phone, takes a pencil, and runs it over the paper. She finds a phone number and address. The doorknob starts rattling, startling the two cops. Donna pulls out her gun. Jody pulls a machete. The door opens, revealing Sam and Dean. Both Jody and Donna yell information at the brothers. Jody tells them that the monster’s a vampire. And Donna questions it. “You want to give her the talk?” Dean asks Jody. In the parking lot, after “the talk” has been giving, Donna is actually handling the news of creatures existing pretty well. Dean and Sam bring up the spa that she went to and, yeah, the owners were monsters too. She gets down to business, handing the piece of paper with a number and address on it to Sam and Dean. Sam searches on his phone, finding out that it’s a local farm. They tell Donna to stay back. But Donna refuses. Jody vouches for her, saying she can handle it. At the farm, Donna stares at the weaponry in the Impala. Dean takes out and machete and hands it to her. “With a vamp, head’s gotta roll.” He explains. “Got it.” Donna says. Sam, Dean, Jody, and Donna approach the barn. They’re startled when Len screams at them to run. The brothers are ambushed, knocked unconscious. Donna and Jody are restrained. “Well hi there sunflower!” The same girl that met Jody says to Sam. The four, and Len, are restrained – their hands tied behind their backs. Jody and Dean are tied to poles, the others are standing out in the open. It turns out that Star, the teenage girl, and her vampires were led, and liberated, by Len. But he abandoned them. Donna points out that she saw him with his sharp teeth, standing over the Sheriff. Len says it was a natural reaction to blood – but he didn’t kill her. That he couldn’t take humans pleading for their lives anymore. It was wrong. Star and her vampires became scavengers, Len turned vegetarian. “You didn’t just become straight. You became a damn cop!” Star laughs. She starts towards Donna. But Len distracts her. He says that he’ll join the coven again if Star lets Sam, Dean, Jody, and Donna go. Star says that she won’t let them go and orders Len to feed on them. He refuses and she beheads him, saying she didn’t know him anymore. All this time, Dean and Donna have both been cutting their binds – slowly. Dean uses the distraction of Len’s beheading to break his binds. He charges and kills all the vampires, leaving Star as last. She approaches Jody, getting dangerously close to biting her. But Donna beheads Star from behind. “Hakuna Matata, lady” Donna says. “Now that’s what I’m talking about!” Dean cheers. They regroup at the Impala. Jody asks Donna if she’s okay. Donna says that she’s fine, but might hurl considering she just beheaded a vampire. Sam and Dean stand at the rear of the Impala. Sam asks Dean if he’s good. Dean says that, for the first time, he was. Donna reflects on how the world is actually full of crazy things. Dean says he finally feels like himself. That he’s hunting monsters, killing the bad guys. Jody says to Donna that if she ever wants any pointers about dealing with the crazy things, she can help. “Okay. Let’s go with that.” Sam finishes.